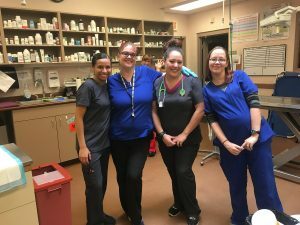 Our skilled technician team, made up of experienced and/or registered veterinary technicians, continually monitor your pet throughout the day and night. This monitoring includes recording each pet’s vital signs (including temperature, heart rate, pulse quality, respiration, mucous membrane color, capillary refill time, blood pressure, and lung sounds), oxygen saturation, appetite, elimination, and attitude. Should a technician(s) have any concerns or notice any changes after such monitoring, they alert a the doctor to the trend and then take appropriate steps as directed. Our technicians participate in thorough “rounds” at the beginning and end of each shift, ensuring all technicians are familiar with all currently hospitalized patients. Rounds typically include when and why the patient presented, abnormal blood test results, any other abnormal test results, diagnostic procedures done or scheduled to be done, whether the patient is allowed to eat and, if so, what the patient likes, whether the patient walks outside including elimination preferences (if any), planned visits by family members, future treatment plan and when the patient is expected to be discharged.